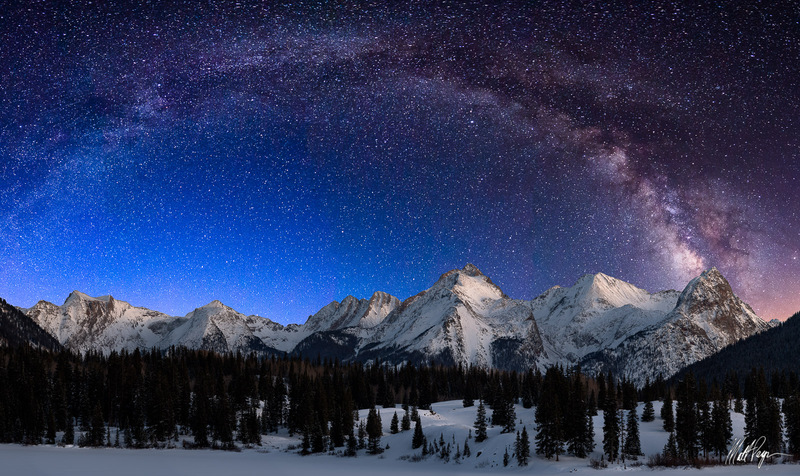 The mighty Grenadier Range of Colorado rises above the Animas River and a snow covered Molas Lake beneath a blanket of thousands of stars in the Milky Way Galaxy. This is a composite image - one taken at early night for the foreground at ISO 100 and f/11 at 2 seconds for maximum sharpness, and one for the stars at f/2.8 for 15 seconds at ISO 6400. The scene includes some of my favorite mountains, including Electric Peak, Graystone Peak, Mount Garfield, Vestal Peak, and Trinity Peak. Molas Lake is located between the towns of Silverton and Durango off of Molas Pass and Highway 550.